you are. Equipped with the latest Bluetooth 4.1 tech, the sound bar supports HSP/A2DP/AVRCP formats, compatible with most smart devices with Bluetooth function. system to your smart phone. 1. If you do not use the sound bar for a long time while it is open, it will move to the sleep mode. You need to press any button on the remote control or the sound bar to rouse it. 2. With the low battery protection function, the soundbar will automatically shut down when its battery runs lower than 3.3 V for more than 15 seconds. 3. The sound bar can be connected to TV through AUX 3.5mm or RCA cable. If your TV only supports the optical or coaxial connection, you will need to buy an audio decoder separately for connection. ▶▶CLEAR & POWERFUL STEREO SOUND◀◀: Dual high-quality speakers in the sound bar deliver surround sound reaching 80db and covering 300 sq.ft. in maximum. Noise-proof HD chipset brings out an amazing home theater experience. ▶▶FIT FOR MOST ELECTRONICS◀◀: The surround soundbar system fits for most electronic devices with audio players, including TV, pc, notebook, smartphone, tablet, MP3/MP4 and CD/DVD player. 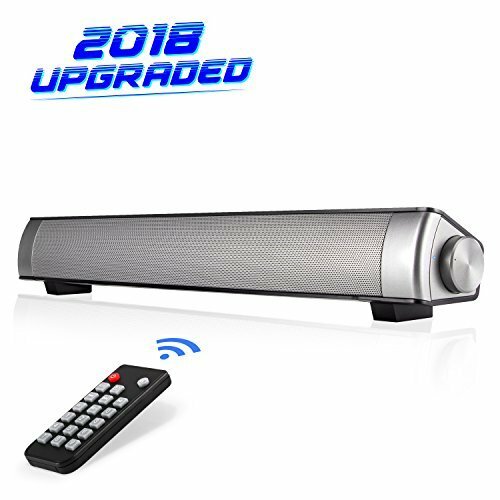 ▶▶UNIVERSAL REMOTE CONTROL◀◀: With the infrared remote control, you can control the soundbar without stopping what you are doing. No need to walk to the tv speakers. ▶▶COMPACT DESIGN & BLUETOOTH TECH◀◀: Slim shape with sleek lines enables you to take the sound bar outdoors. Connected via AUX 3.5mm/RCA cable or Bluetooth. Improves your audio experience everywhere. ▶▶PERFECT PARTNER FOR TV◀◀: The sound bars for tv is a space-saving option if you are unsatisfied with the sound volume or quality of your TV. AUX 3.5mm or RCA port is needed for TV connection. If you have any questions about this product by monochef, contact us by completing and submitting the form below. If you are looking for a specif part number, please include it with your message.